I'm ill in bed bored out of my mind and thought what better way to spend my day than hunting some beauty products I'd like to try this year. 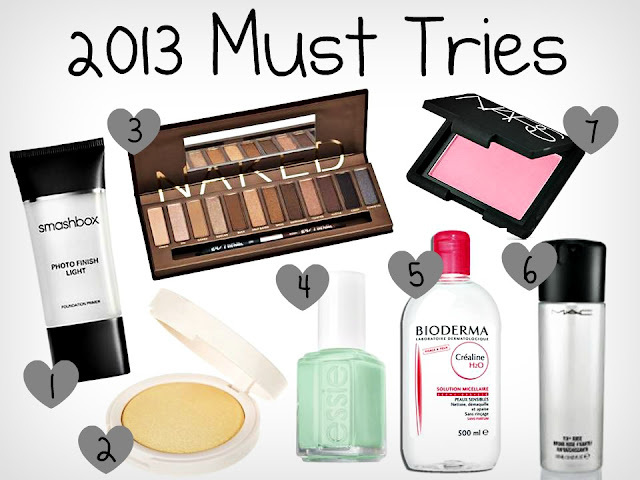 Beauty bloggers around the world rave about these products and this year I plan to try them all. The Smashbox Photofinish Primer is considered one of the best in the beauty industry with it creating the perfect base for any foundation. Again, Bioderma is considered the holy grail of all make up cleansers and is supposed to leave your skin feeling super refreshed however, living in the UK makes it hard to find but you can find some good deals on Ebay. This Christmas I received the Naked 2 Palette and fell in love with it and now I want to try the original "NAKED" but do you think its worth it when I already own the Naked 2? Finally I cannot wait to try MACs Fix+; this water substance is said to leave your make up looking fresh and dewy taking away any dryness allowing your make up to stay refreshed all day long. Which beauty products can you not wait to try this year?